The 4-Foot Fold-In-Half Camping Table from Lifetime Products is the perfect addition to your next outdoor barbeque, picnic or tailgate party. 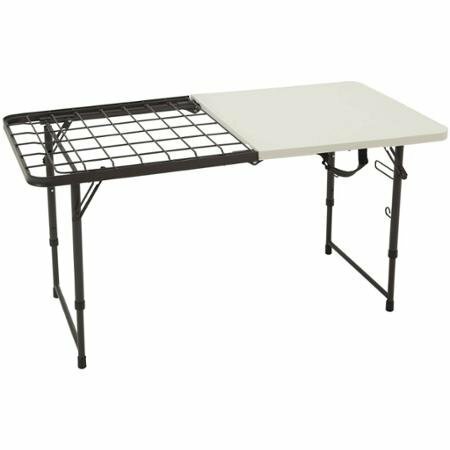 This unique table has half of the tabletop constructed of high-density polyethylene (HDPE), with a heavy-duty metal rack as the other half. The table surface is stain resistant, easy to clean and UV-protected, and the sturdy steel frame has a powder-coated finish that protects against weather, rust and corrosion. The heavy-duty metal cooking rack is perfect for cooking or hot items. The table also has a convenient fold-in-half design with a carry handle for easy transport and storage, and three adjustable height settings (19, 24 and 29 inches). If you have any questions about this product by Lifetime Products, contact us by completing and submitting the form below. If you are looking for a specif part number, please include it with your message.